The Saucony Exodus 5 is a rugged, cushioned trail shoe built for protection and comfort on demanding terrain. The Exodus’ comfort, responsiveness and traction help it stand out from what is a crowded comfort trainer field. 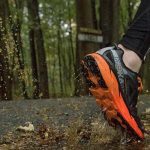 At first glance, the Xodus appears to be a rather typical cushioned trail shoe. However it has a few characteristics that help it stand out from what is a crowded field. First among these is comfort. While one would expect shoes in this category to have ample cushioning, that does not always translate to comfort. The Xodus however nails this with a bouncy but not firm midsole and soft upper materials. The second stand out characteristic is the overall handling and responsiveness of the shoe. This is a consequence of both the midsole foam and the wide ground contact area. There is a bit of sloppiness in the upper that hampers performance on off-camber surfaces, but otherwise the Xodus has better agility and energy efficiency than its peers. Perhaps not best in class, but definitely above average. Last is the traction. The lugs on the Xodus are particularly rugged and inspire loads of confidence on just about any surface. The Xodus 5 is perfect for runners who want a stable, cushioned platform that doesn’t get totally bogged down when the pace picks up. 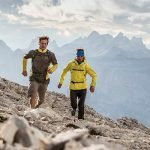 Although it is definitely overkill for groomed singletrack and smooth dirt roads, runners who need the extra support will appreciate what the Xodus has to offer. It also is a bombproof choice for long outings in the mountains and makes an excellent recovery day shoe. Comfort is for the most part outstanding. The materials strike an excellent balance between softness and support, particularly underfoot. One potential issue is a supporting band in the midfoot area that connects to the lacing system, although it appears that it could be disconnected if problematic. The beefy outsole provides excellent push through protection. The upper protection is more typical but should be adequate for nearly all conditions. Foot security was generally adequate at the slower speeds typical of long runs. However, there was definitely some foot movement inside the shoe during more aggressive running on technical terrain. While this does not necessarily detract from the intended purpose of the Xodus, it does limit its versatility. The Xodus is definitely more responsive than the average cushioned trail runner. This was appreciated during periods of faster running, such as long descents, as well as on climbs. While it is not and never will be a speed shoe, it does handle increases in pace better than most shoes in this category. The improved efficiency also is beneficial when a runner becomes fatigued during the latter stages of a long run. The ground contact area of the Xodus is large enough to enhance stability and traction, but not so large that it impedes precision. The overall balance of the shoe is excellent, and the 4-mm drop helps make for a relatively easy handling shoe given the weight. The traction is downright bombproof, and simply devoured everything that was thrown at it. An MSRP of $120-130 seems to be fairly typical of shoes in this category, so the Xodus’ price of $110 is a good if not outstanding value.